Is Ramen a Good Diet Food? Ramen noodles are dried Asian noodles that you can make into soup by adding hot water, and they may be appealing if you need to lose weight because you can eat them almost any time. A good diet food is low in calories, filling and nutritious, and ramen may not meet all of these criteria. However, ramen noodles can be part of a healthy weight-loss diet if you use them carefully, and a nutritionist can help you fit them into your meal plan. A good diet food is high in dietary fiber or protein, decreasing your hunger so that it is easier to limit your total calorie intake. Ramen is not high in these nutrients, and a serving has only 4.5 g protein, or 9 percent of the daily value, and 1 g dietary fiber, or 4 percent of the daily value for fiber. To make your ramen soup meal or snack more filling, eat it with some lean protein, such as chicken or shrimp. 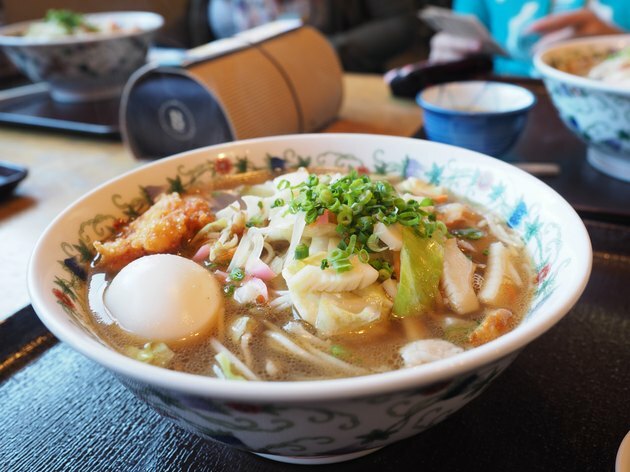 Ramen soup can be a good diet food if you make it carefully because eating chunky, low-calorie soup may help you lose weight, according to the 2010 Dietary Guidelines from the U.S. Department of Health and Human Services. Prepare your ramen with extra water so that it has a lower calorie density, which means that it has fewer calories in the same size serving as when you use less water. Add high-fiber vegetables, such as broccoli, water chestnuts or carrots, to make your ramen more filling. To lose weight, you need to create a calorie deficit, which means burning off more calories than you consume. Ramen can make this difficult because it is high in calories, with 187 calories per half-package serving, or nearly 400 calories if you eat the whole package. Ramen provides 27 g carbohydrates, and it is a high-glycemic food because it is a low-fiber, refined carbohydrate. High-glycemic foods can impede weight loss because they cause you to be hungry soon after your meal, according to the Linus Pauling Institute Micronutrient Information Center. A good diet food is high in essential nutrients so that you can meet your nutrient requirements without going over your calorie limit, but ramen noodles are not high in calcium, iron, folate, potassium, most B vitamins or vitamins C, E or A. If you use the entire flavoring packet that comes with your ramen, you can easily get 1,000 mg sodium or more, and a high-sodium diet can raise your blood pressure. Finally, ramen noodles may contain acrylamide, which is a carcinogenic compound in many baked foods, according to the U.S. Food and Drug Administration.